Maj. Paul W. Harrington - De website van vintageflightfoundation! The VFF team is proud to introduce you to our honorable member Maj.(ret) Paul Harrington. 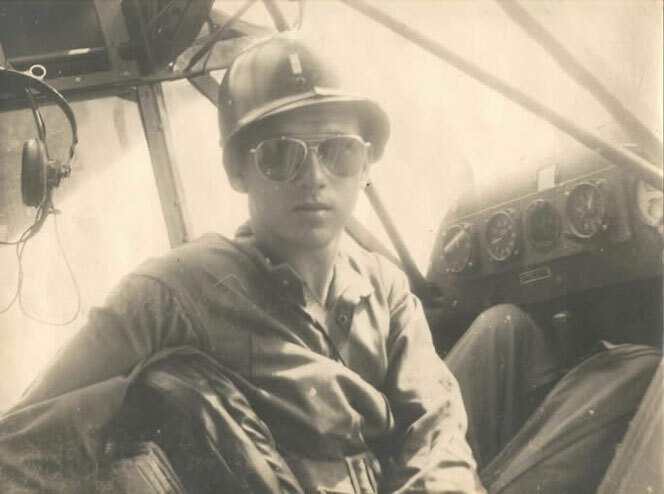 He is a veteran WW2 Liaison Pilot and at the age of 20, he served under the 62nd AFA Bn (Armored Field Artillery Battalion) in the European Theatre of Operations. He lives in Texas, USA. We are very proud and honored to known him. Picture showing Lt. Paul Harrington in his Piper L-4H in Pisek, Czechoslovakia on VE Day 1945. My love of aircraft probably started in 1927 as our family was visiting relatives in Minneapolis, Minnesota and read in the paper that Lindberg was going to land there with the Spirit of St. Louis on his tour of the USA after his successful crossing of the Atlantic on a solo flight. My dad held me on his shoulders so I could see the landing. After he landed, the crowd broke through the ropes and surrounded the plane. In 1933, my parents paid for me to fly over Chicago and the World’s Fair. It was in a Curtis high wing monoplane with a round engine, wicker seats, and the pilot said I could be co-pilot. Two adults sat in the back. What a thrill. In 1937, Dornier sent an experimental passenger plane to the United states. I had a steel orange passenger plane that we had obtained from Kroger with green stamps, and so I painted it black with white wing tips like the Dornier, and put 1937 on one wing and DO-X on the other. I still have the plane hanging on my office wall. It is intact except for losing its vertical fin and rudder. My military story begins when I enrolled at Purdue University in the fall of 1940. Every physically able male at Purdue had to take two years of basic ROTC (which at the time was only Artillery). Before the two years was over, the Japanese had bombed Pearl Harbor, and most of our thoughts were of what our situation would be. Before completing the two years, I applied for admission to the Advanced course ROTC, and was accepted. Even in the basic course there were certain perks, as wearing the uniform while hitchhiking home on weekends was made easier. Purdue speeded up their schedule so that three semesters were crowded into one calendar year. So, in February of 1943, I was in the first semester of my senior year. About the first of February, they told us that we needed to join the Army Reserves or we would be drafted. If we were drafted we would not be able to use our ROTC experience, so I joined the Reserve. Two weeks later we were called to active duty in the Reserves, went to Ft. Benjamin Harrison in Indianapolis, had a physical, issued clothing, sworn in, and assigned to the Army Specialized Training Program (ASTP) at Purdue. Pvt Paul W. Harrington, 35096697. The only change that was made was to wear uniforms every day, and get paid $50.00/month. At the end of that semester, April 1943, we were given the choice of staying and finishing, or going to OCS at Ft. Sill. I choose Ft. Sill, was promoted to Corporal, at $66 / mo. After 13 weeks of training, I received my commission on my 20th birthday. 2nd Lt. 0523375 (not an AUS number but a Reserve number). I applied for pilot training, and was accepted in the class of 43L43 at Denton, Texas. I graduated from there on the 19th of November, and was sent to Ft. Sill to the advanced course. My term at Denton was not without some struggle, as I could not get along with the first instructor to which I was assigned, but Capt. Cross (later to become 3rd Army Air Officer) intervened and got me assigned to his instructor (a most comfortable person to be around). Mr. Hartley, the owner of the field had a negative stagger, four place, radial engine, Beechcraft. When I visited the field a few years ago with my son David, the plane was still in one of the hangers. Of course, living in the men’s dorm at NTSTC (now North Texas University) was a treat along with having Texas Women’s University in the same town, as we were about the only males around. When you went to dances, the girls would cut in instead of boys as I was accustomed to at Purdue. We flew L-2’s. L-3’s, and L-4’s. My favorite was the L-4 fortunately as that was the only plane I flew until after VE Day. At FT. Sill, we did extensive road and small field landings, adjusted artillery fire, and endured the cold. I graduated in January of 1944 and was assigned to the 76th Division at Camp McCoy, Wisconsin. As soon as I arrived, we went on winter manoeuvres in the northern Peninsula of Michigan. We were issued skis for the planes and almost all arrived at a base in Michigan, but several had to get new props when they hit some patches of gravel in Madison. Flying with skis was different since there were no brakes. It was kind of like driving a speed boat in the water, you had to make a judgment about how long it would take you to stop. We used d-1 heaters with a hood over the cowl to warm up the engines before starting. They were also handy for heating your tent as the temperature would drop to -30 degrees at night. It was fun landing on all the lakes in the region, and if there was a school nearby, they would let out school to see the aircraft. I was not out in the field very long before my friend Scott asked if I would like to fly for 16th Corps HQ stationed at the Kings Gateway Motel in Land o’ Lakes, Wisconsin. I am not an Idiot so I thought that it would be great. We flew the brass out to observe the manoeuvres. We also tried to fly down the ski jump, built alongside the Motel. I did manage to ski down it on a pair of issue skis without falling. Once we had some parachutes that needed to be repacked so we jumped off the bar and yelled Geronimo and pulled the rip cord. (hey, I am still only 20 years old.) While at Camp McCoy, my main flight duty was to fly my Bn CO to a small town at noon, Mauston, Wisconsin, so he could have a drink. There was a bar right next to the landing strip. About July, the Old man called me in to say that there were orders for me to go overseas to the European Theatre of Operations as a replacement pilot. He said he could stop them if I wanted to, but I told him that it looked like the Division would go soon, and I would take my chances on going to the ETO rather than the Pacific.Theater of Operations. I was sent to Camp Kilmer N.J. And while there went to NY City, and to Baltimore to visit a friend of mine in the Navy. We were not allowed to say where we were, but I would usually include I wish that I could ever see a poem as lovely as a tree in my correspondence. We departed New York City aboard the Queen Elizabeth. At the time was the largest liner afloat. There was a crew of 10,000 and there were 25, 000 troops aboard. I was assigned a bunk for eight hours, and two other officers were assigned to the same bunk for the other two eight-hour times. It took us only four days to reach the Furth of Clyde in Scotland. From there we went by train to southern England. We stopped in Liverpool, and I couldn’t believe that those people were speaking English. We were housed in some new apartment buildings. I noted that all the plumbing was on the outside of the building. I asked one of the locals about it, asking if that didn’t cause problems with freezing, He said yes but when they were on the outside they could easily be repaired. And we put ours on the inside so they don’t freeze and don’t need to be repaired. I then went to Dover and boarded a Dutch ship to Omaha Beach. It was rough seas that day and only part of us unloaded. The LCVP was first even with the deck, and then 20 ft. below it. I never again saw my duffle bag until after the war, it was found in a Paris Depot and was shipped directly to my home. (all those good leather flying jackets). I did have my b-4 bag. I was sent to a Reppell Depple near Versailles and was given a new issue of clothing and a Parka for winter flight. I was still in possession of my A-2 jacket. After a tour of Versailles, I was assigned to the 62nd AFA Bn and joined them on the 16th of October. in Heerlen, Netherlands. A month before I joined the unit both pilots were shot down by enemy fire. Sgt. Follard and his observer, Lt Parham, were KIA with a crash and burn, Sgt Earle and his observer, Lt Zollner were not wounded. Lt. Lionel(Biff) Hoffman replaced Sgt Follard . The pilot that I replaced had just been promoted from Staff Sgt Earle to Lt. with orders to return to the States, He was sent to Ft. Sill where he was assigned to teach tactics. Our CO, Donald V. Bennett, was a West Point Grad who later became a Four-Star General. He was the best CO that I ever had. You can read his book, Honor Untarnished by William Fortschen. His idea was to have one plane in the air at all times, and if you were on the road, a plane was to fly point. He also didn’t want a lot of registration on a target or the target would disappear. We would usually fire a round of smoke with coordinates, and the second command was fire for effect. My first mission was over Maastricht, Netherlands. The air section of the 62nd had two L-4 aircraft, a half track, a jeep with trailer, and a ¾ T truck with trailer. The half-track and ¾ ton also held our radio equipment. For personnel, there were two pilots, two mechanics, a driver for the jeep, a radio operator, who also doubled as the driver for the ¾ T and I think one of the mechanics drove the half-track When I joined the unit, Lt Lionel(Biff) Hoffman was the other pilot, and there were always two observers with us. The names that I remember were Lt Riolfs, Lt Zolner, Lt Fritz were three of those that rode with us. Our mechanics were superb. We never had to worry about whether the planes were in top condition. There were enough other things to worry about. One of the mechanics was Sgt. McKinney, I don’t remember the other one’s name. Pfc Blackwell was the jeep driver, and the ¾ T driver was from New York City, but I don’ remember his name either. After I had been with the Bn for several weeks, my observer, Lt Rolfs and I were given a three-day pass to Liege. The Sgt Gallegos who drove us in the Jeep also had a three-day pass. When we got to Liege, the people at the Hotel said the Sgt couldn’t stay with us, so I loaned him one of my shirts, and a cap, and bars and went back and registered him as Lt. The next time I ate with HQ Btry, The Sgt came up and put his arm around me an announced to all the personnel that this was the best damn pilot in this Army. Up until that time I was pretty much a stranger in the outfit, as the 62nd had made the invasion of Africa, and Sicily, and D-day. These were battle hardened troops that didn’t like strangers. I never had a problem after that of being a stranger. Shortly after joining the unit, we were assigned to task force Dolf. Col Dolf was the commander of the 102nd Calvary Group. It was composed of two squadrons of light cavalry (the 38th Cav Recon Sqn mechanized, and I think the 102nd Cav Recon Sqn Mechanized, our armored field artillery bn. a company of rangers from the 2nd Ranger Battalion, a company or more of Engineers, from the 112th Engineer Bn and a battery of 40MM ack, ack. We moved to Belgium and occupied a large area of front. A 2man outpost every 200 yds. The CO would have the 18 SP 105’s arranged as nine 2-gun batteries which we would register from time to time to confuse the Krouts as to how much fire power we had. This lull in battle caused us to search for better food than the C and K rations that we had, so my observer, I think that it was Lt. Zolner, took along a carbine and winged a deer. We radioed the ground crew the coordinates, and they field dressed him and we had fresh venison for a while. We seldom found any targets to shoot at, but I remember that we found a German truck one day to fire on. When the mission was completed, my observer said we had destroyed one truck and one cow. Fire control wanted to know if cow was enemy. After playing this game for the month of November, we were replaced by two Divisions, the 106th and I think the 99th. The 106th became the first full combat division to reach Berlin. (as prisoners, of course) The Germans acted on old intelligence data to make their battle of the bulge. Task Force Dolf (102nd cav) was next assigned to support the 78th Division in the Urft and Schwammuel Dams on the Roer river area. Enroute, I always said I had an engine failure, but that was just to make a long story short. The truth is that Biff got a farmer to plow out a strip for us with a team of horses and a makeshift wooden plow. The strip was both narrow and crooked., but we managed to take off and proceed towards our new destination. I was flying on Biffs right wing, when I lost him in the haze and clouds. With no Instrument flying experience, I proceeded to fly on the same compass heading and using needle, ball, airspeed, altimeter and magnetic compass, I attempted to continue the flight. I believe in Devine guidance. I prayed for such direction and after a period a break occurred in the overcast and I proceeded to go down through it. I found a place to land and proceeded to make a landing. I knew it was deep snow so I tried to drag the tail in before letting the wheels touch. I had already chopped the throttle and made a dead stick approach. When the wheels hit it flipped. I had lots of time flying with skis in the states on winter maneuvers, but I guess that asking for skis in combat was not thought of. I would have sworn that I rolled out on the wing right away, but when I went back later after being treated at a Company aid station, the entire inside of the plane was covered with blood. I had hit my head on the dash, and bled profusely from my nose. I also skinned my shin on the gas tank. An infantry patrol found me and took me to their aid station. They said had I gone any farther in the direction I was headed I would have been in enemy territory. After about three days I could re-join my unit and pick up a replacement aircraft. I think that Hq Btry was in the town of Roetgen. Whatever the name of the town, our air strip was close enough that we could eat with them. I remember there was a dead German officer laying across the sidewalk leading up to the building housing the mess hall. You had to step over him or go around him in order to get in to eat. Not a very appetizing approach. After three days, the Col told the Burger Meister to bury him, and they complied immediately. The Germans dropped paratroopers on us about the 15th of December, and dropped supply chutes for them. On the 16th, the weather was too bad for flying, so I went out with a crew to pick up one of the supply chutes and I wore a piece of that Camo Silk for a scarf the rest of the war. The 78th Div CG called a meeting of his Commanders to which our CO was invited. The CG wanted to make plans for retreat. Col. Bennett said,” General if your men come back through us, they will find 18-105’s pointed right at them, as we are not retreating “. That ended the talk of retreat. We had some impressive targets on the 17th. During this time, we caught a Panzer Unit on the Road and like shooting fish in a barrel, raked from one end to the other. I never saw such destruction. We asked for and received Army Arty. 240 MM They are impressive when they hit. We also fired 155’s and our 105’s. In one way, it was a fun day as we never again were able to fire a Division Artillery, Corps Arty, and Army Arty. What I failed to mention that the weather was bad. Both Biff Hoffman and I flew from daylight to dark and had many targets of opportunity. the wind was so strong that the ground crew had to catch the plane when we landed and hold it while it was being refuelled. We would grab a K ration, and something to drink while they were refuelling, and then back into the air. The 78th air officer had grounded all their planes, so we were the only two flying in the whole area. I imagine that the 78th Air Officer caught hell over that. Biff put me in for a DFC, but the old man turned it down. One day while flying an air Ops mission, I observed an attempt to bomb the two dams by Allied forces. B-17’s flew at high altitude in formation and dropped their bombs, then Lancaster bombers came in in single file at a much lower altitude to do their bombing. One unlucky Lancaster caught a round of flack before dropping their bombs, and blew up in mid-air. All I saw after the explosion were a couple pieces of wing falling to the ground. The bombing was totally unsuccessful as the Dams were more than a thousand feet thick at the base. and is all the bombing did was to make pock marks on them. There were a couple of other incidents that stick out in my memory during this stationary period for our unit. One day when we were in the air, they said that there were eleven ME 109’s in a formation. I thought that is ridiculous, as we had never seen more than two enemy aircraft together in flight. I was wrong again! One peeled off to get me, as he turned, I kept turning inside of his turn until I got down on the tree tops. He then took one pass and put a couple of holes in one wing, which we emergency patched with pieces of map and duct tape. Another time the ceiling was probably no more than 400 feet, so I thought maybe if we got on top we could have a better view. We did of the sun and almost a complete overcast. I found a break in the overcast (BINOC) and went down through it, came out in a valley and got fired on by machineguns from both sides of the valley. Since I had dived through the overcast, I had excess speed and either they were poor marksmen or their guns wouldn’t swivel fast enough to track us, but we only got a couple of holes in the rudder and vertical stabilizer. I learned to pray a lot while flying. We went down the Ahr valley and were settled in the town of Walporzheim. Beautiful terrace hillsides for growing grapes. I think almost everyone got drunk on all the wine, brandy, and calvados. I think that is why the Germans were unable to blow the Remagen bridge, because they were too drunk and our brave soldiers had enough to give them great courage. It was here that while in the air I saw my first ME262 trying to bomb the Remagen bridge. We all said that thing can’t fly, it doesn’t have any props. After crossing the Rhine, we went north and the Rangers said they had captured an airfield, so we landed and taxied into a hanger. There was a brand new Storch there, and the Ranger captain wanted me to fly it. I said I don’t think so. I would probably get shot down by both sides. The Germans had stashed a lot of booze, and cases of good cigars, so we all helped ourselves. The Ranger Capt. said let’s take a ride in this German Staff car, so we piled in and opened the hangar doors, drove out on the apron in front of the hanger and were met by a hail of machine gun fire. The driver did a 180 and went back in the hanger. I said to the Captain, I though you said you had control of the airfield. He said we have the good part. We took off close to the hangars the next morning. After this our unit tried to make as many miles on the road as the Bn could go, and at night they circled the M-7’s and we tried to find a field close by. One such morning when we got up and were getting ready to fly, seven German soldiers came up with their arms over their heads. We took their rifles and told them to go in a westerly direction. Biff was fluent in German. Not many other incidences of note between then and our arrival in the town of Pisek Czechoslovakia. Where we met the Russians. VE Day was declared. 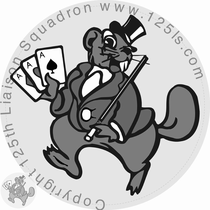 I had compiled 135 combat missions, five short of getting my third oak leaf for my air medal. The town of Pisek did not have any electricity so the Bn set up a generator in the middle of the town by a small lake and wired the homes we were staying in. The lady that owned the house we were staying in would come in and look at the bare bulb in the middle of the room and say schein, schein. To us it looked ugly. There would also be a crowd around the light at the generator as they had never seen electric lights. We went over across the lines and had a few drinks with the Russians, but their guards tried to shoot us on the way back, so I never went back again. Our Col saw the Russians crossing over the supposed line of demarcation and occupying a town on our side. He took the Bn and ringed the town with the M-7s, and told the Russian Commander to leave the town and return to the line that had been drawn for our separation of Army’s. His bluff worked as the next morning the Russian withdrew his forces. Since the war was over, I flew back to Corps HQ and asked if they needed another pilot. So, they assigned me TDY in Pilsen to fly the mail. We had two flights a day north and two flights a day south. One pilot would fly the north route in the morning and the south one in the afternoon. Another pilot would do the same thing but in reverse order. The North flight went to Marianske Lasne, Czechoslovakia, and the south flight was to Innsbruck, Austria. Pretty town, but the landing strip was on the side of a mountain, you landed up the mountain and used close to full throttle to taxi to the end of the runway where someone would pick up the mail and give you mail to return. You took off down the mountain with a very short roll. We had lots of cold beer at Pilsen, the good pilsner kind. Sometimes have one for breakfast. 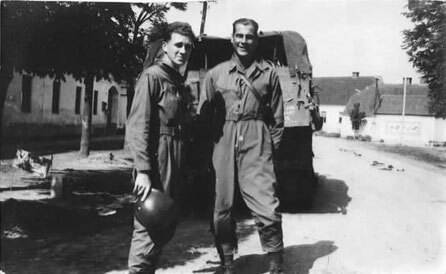 When we pulled out of Czechoslovakia, I went to 3rd Army Hq and met with Maj Cross and asked for another TDY. He assigned me to an Air Force unit at the airfield at Prien, Germany, on the ChemSee. For me this was the fun part. We ferried planes that had been turned in by units returning to the States, to Frankfort, Germany (mostly L-4’s and L-5s) and had a pick-up plane of a C-64. We found that this would carry a pilot, co-pilot, 10 passengers and 3-50 litre barrels of beer as we would stop in Augsburg, Germany on the way back of every trip to get the beer. That way the unit did not run out even if we couldn’t fly some days because of the weather. There were twelve officers including the CO and a bunch of mechanics. The highest-ranking officer was a 1st lt. If we didn’t have enough planes turned in by departing units, for everyone to fly that day, it was a day off. I helped crate up a ME163 for Wright Patterson destination. You can see that plane in their museum. Also on days off I would fly over to Herron Island on the ChemSee and tour King Ludwig’s castle. On one trip to Frankfort, the weather deteriorated so badly that the pickup plane didn’t make it. Another pilot and I took the leave train to Augsburg, and stayed overnight in a hotel. The next morning while having breakfast, a couple of red cross girls asked if we would like to accompany them in their Mercedes to Garmish Partenkirchen. We considered the offer for maybe thirty seconds and said OK. When we arrived in Garmish, a friend of mine was running the leave hotel there and fixed us up with rooms. The next day I toured the passion theatre, the next day I took the cog railway up to the Zugspitze. I just watched the skiers. That evening in the bar we convinced a Capt. to use his driver and jeep to take us back to Prien. When we returned, they had not flown since we left and the rest of the pilots were still left in Frankfort. Shortly after arriving at Prien, a mechanic asked me if he fixed up an L-1 to make it flyable, would I fly it. I said only if you will ride with me. So, he fixed one up from the several that we had there that were tagged salvage, and I had my own personal plane from then on. He took all the radios out of the back shelf so we could put two on the shelf and two on the rear seat and make it a five passenger. I think I only flew it that way once. I flew it up to visit my unit that was in Dachau, and did watch the hanging of one of those guilty at the Nurnberg Trials. I visited the CO, Lt. Col. Bennett, and he invited me to his quarters. He said help yourself to the drinks while I shave, so I poured a glass full of the pitcher of orange juice, took a good drink and thought wow this really has a bite to it. So, I asked him what was in it and he said its half OJ and half Alcohol. We had a good dinner together. I learned a lot of things from Col Bennett, always leave an area in better condition than you found it (that meant filling in fox holes and policing the area). He also didn ‘t like the great chasm between officers and enlisted men. He said we are all the same, we just have different jobs. And he respected everyone as each person was important in their job for a unit to be successful. Somewhere in this time period, I took a seven day leave for the UK. I don’t recall anything about the trip over there, spent the seven days in London seeing the sights of London and then returned. I was on a leave train from Le Harve to Paris and someone told me that I was in charge of the train. So, I organized a car for drinking and gambling, and the rest were to remain quiet. We arrived in Paris and had to change trains, there were three EM’s from my outfit, for which I was responsible to get back to our unit. We were sitting at a table outside at the Le Triumphe bar on the Champs Elessye when impromptu parades started and the people all chanting Le Gare e Fini. So, the men asked if we could stay in Paris for a while. I said I am broke, and they said have you got any cigarettes? I said I had three cartons in my b-4 bag at the station. They returned about an hour later with $120 and said is that enough? I said I thought so and to meet me here in three days. I continued to drink and dance the night away, the next two days I toured Paris and found it much easier to get around on their subway, than it had been in London where I could speak and read the language. They met me at the appointed time and we took a leave train back to the base. One time, (I don’t remember where I spent the night,) I went out to fly the L-1 back to Prien there was frost on the wings, but I didn’t think that would make much difference (once again poor judgment) the strip had been cut through a road that was about six feet high. Taking off with full left rudder and full left stick, I still hit the corner of the road with my right landing gear, which broke loose. I thought that since I was airborne I might just as well go back to Prien and make a landing on the good gear and tail wheel. Well on landing the right gear also gave away and I slid in on the belly. Prop wrapped around the engine cowling. Since it had already been rated salvage, it now was. I was allowed to pilot the C-64 one day, and while flying was joined in formation by a B-17 with his flaps down and gear down so he could go slow enough to fly with us. I waved and he waved back pulled up his trash and took off. The 62nd AFA Bn left in November for the States, but I didn’t have enough points to go with them. I was eventually assigned to the 96th Division to return home. When I arrived at Le Harve, to go home, I had amoebic dysentery. For a while I didn’t care whether I lived or died. I didn’t know one could get so sick. When I finally was well enough to board a ship (the Rock Hill Victory) I probably weighed only 110 pounds. It took eleven days to cross this was the storm that battered in the nose of the aircraft carrier Hornet. The ship would roll 47 degrees in each direction. Needless to say, almost everyone got sick but I didn’t. You had to lock your legs on the table legs at mess, and tilt your plate with the roll of the ship in order to eat your meal. Many a day you didn’t go on deck because of the foul weather, but when I could, I would go back to the fan tail to get a better view. One of my friends who had been sick most of the time decided to go out on deck, but he only made it to the rail before upchucking again. It was a precious sight to sail into New York Harbor and go past the Statue of Liberty. Great to be home. I attended summer camps at Camp McCoy, Ft. Sill, and Ft. Riley. When the Air Force formed their own branch of service, they sent me a commission in the Air Force, but I returned it as the Army already had their program in place for me to get my required hours in by flying from the local airport in a leased plane instead of me having to travel to an Air Base that would have the kind of aircraft that I could fly. One of the summer camps at Camp McCoy, the Co said we were going to learn to fly night flying and we would line the runway with gallon cans stuffed with rags and kerosene for flares and we would take off before dusk and just work into the night. No check outs, just do it. We were flying L-19’s at the time. After my original flight school, I was never checked out in an aircraft before flying it. I don’t think that would happen now. One of the times at Camp McCoy, I was flying the Commander of the Indiana Region around and he asked me was I satisfied with the program, and I said I couldn’t. get a promotion because of my assignment and I had been a 1st Lt for nine years. He said call me when you get back and we will arrange something. I did and I was assigned to an Engineer Battalion in Gary Indiana. When I met the CO Col He said I see you’re here for a promotion. So, the way had been paved and I received a promotion shortly afterward and then transferred back to the Battery in North Judson. In 1959, they said that we had to be instrument qualified if we wanted to retain flight status. Well I had turned down ground pounder jobs that would have given me a promotion just to remain on flying status, so I applied for Instrument school at Ft. Sill and was accepted in the October class of 1959. I only recall one incident that sticks out in my mind, we were enroute from Ft. Sill to Ft. Worth during instrument conditions. We had a total electrical failure, so no radios and only compass, needle ball and airspeed for instrument flight. Eventually we saw a BINOC, the Instructor says I got it and we descended through the hole. When we landed at Meecham, we found a ground wire had broken loose from the engine creating the electrical failure. By this time, I was flying a Cessna 195 for my training, so had plenty of instruments to continue practice with instrument flying. I recall my wife, Ethel, riding with me to a teachers convention in Lafayette, Indiana in this Cessna 195. Shortly after take-off, we were in the soup. I flew on instruments until I saw my wife’s face was the same color as the windshield, so I did a 180 and returned to Knox. I tried to take the officers advanced course by correspondence, but my record with the Army was the same as with college courses that I enrolled in that way, I never completed any of them. So, you could say my record is 100%. The army said I either had to take the advanced officer course or be discharged. Well I had seventeen years invested, so I asked the school where I had been teaching for thirteen years if I could have unpaid leave to attend. They (the Superintendent) would not give me an answer, so as the deadline came, I resigned and went to Ft. Sill for Advanced officer training and Nuclear weapons employment. Since they only had this as part of the Advanced Course for a very short time, I may have been the only pilot rating (MOS)with the NWE tag. After completing the course, I was retroactively promoted to Major. I then was on temporary active duty with 5th Corps at Battle Creek, Mich. Purdue found me a counselling job at Willowbrook High School in Villa Park, Il. I went there for an interview while still on active duty, and was hired for the school year of 1962-63. So that ended my active duty with 5th Corps. I was still flying out of Knox for my flight training, as I was now flying a Piper Commanche. My favorite airplane for flying. It had tip tanks, retractable gear, auto pilot, dual instrumentation, and would cruise at 210 mph at 10,000ft. This continued until the owner decided to upgrade to a twin engine aircraft. I did not want to make the adjustment, so now took my flight time at Ft. Sheridan, Ill. I was either flying l-19s or U-6s from there. I had to go once a month to the Bn in South Bend, Ind. By 1965, it looked as though I was no longer being protected from extended active duty by being in an active reserve unit, as the need for Army Aviators in Viet Nam was becoming greater so I decided to transfer to the Retired Reserves. Transfer was accomplished on 1Jul 65. Twenty-two years, five months of service. I was transferred to the United States Army, Retired, on 12 Aug 1983. Since retirement, we used the Medical facilities, Commissary. and BX at Barksdale AFB, until age 65 and Medicare and then they didn’t want to have any more to do with us medically. I even had a Colonostomy there. I have used Army. Air Force, and Navy bases for housing., and have used military air for trips to Spain, Germany, Italy, England, Alaska, Hawaii, and Australia. The greatest thing the Congress did in 2001 was to give us tricare for life. so, I apologize for any errors.